Today has been long and tiring, with a headache much of the day. I had my first real visit with my new therapist and my directive was to draw 3 trees; before, during, and after a storm. Once my worries that I'd have to use regular pencils and actually "draw" were put to rest and I had my choice of pastels, medium I'm more comfortable with, I set to it. I like painting and collaging trees. I love tree pose, Vrksasana, and often teach it with several variations one of my earlier yoga teachers taught me. I love being in forests and in the company of old trees. This love of trees and materials that helped me feel confident made the therapy session art-making really pleasurable. I was really intrigued at what my art told her, it showed resilience and optimism, a hopeful outlook. Without intending to, I'd made the trees different, with the "after" tree being even more strongly rooted to the earth and taller, having weathered the storm with growth. My before tree also turned out a little larger than the "during" tree, which looks worn a bit thin by the storm. I'm sure it won't always be so lovely and fun, but starting out this way is great and I look forward to my next session in a week. I'm feeling absolutely worn out tonight, but hugely grateful to have this chance to explore art therapy. 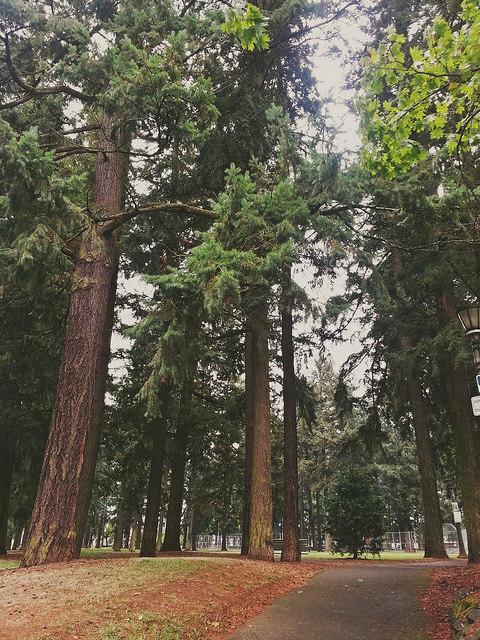 Today I'm particularly grateful for all the trees around me here in Portland. I thought to myself while out walking the dogs that I've had some good role models in the trees around here, seeing how they hold strong to the earth despite sometimes fierce storms. Going into teach after therapy I paused walking past all the tall, old trees at the community center, and how I've been coming to see many of them for much of my life! Now that I teach for the City 3 days a week I get to walk in a park I went to frequently in my childhood.